Turn your decreases into show stopping texture with this simple new technique. Start with a simple idea The new Showy Decreases are worked over 2 rows starting with a slip stitch on the row before the decrease. It's a simple concept that opens up so many possibilities. More Options With this basic concept we've created an entire series of decreases: right and left slanting, double decreases and a wonderful center decrease that joins a series of decreases. We’ve also used them in all the ways shown up top. 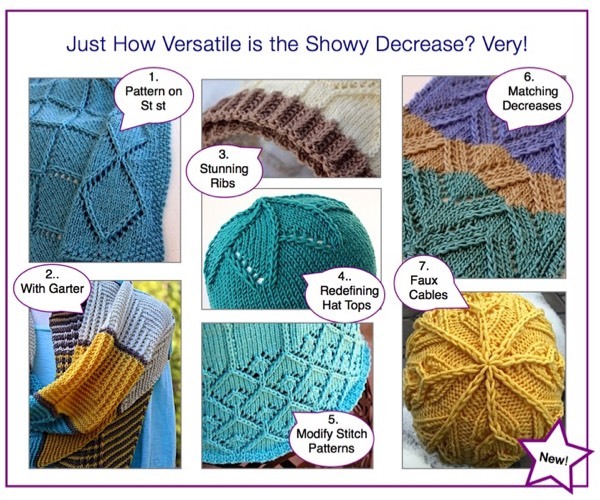 Try using these decreases in many stitch patterns and you will be amazed at the transformation. Eyelet patterns lie more smoothly in the fabric and accent stitches are clearly defined. And best of all, it's simple to understand and knit. This is not intricate lace knitting (although lace knitters will want to try them too). There are so many applications that we'll be rolling out ideas for months to come! - There are over 30 blog posts that describe and show you how to use it. - We’ve also used it with garter stitch. You can read all about those projects here.